The Mauzer is a hybrid dog crossed between the Miniature Schnauzer and the Maltese. 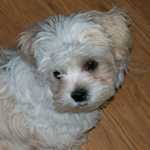 The Morkie is a hybrid dog crossed between the Maltese and the Yorkshire Terrier. The Highland Maltie is a hybrid dog crossed between the Maltese and the Westie.